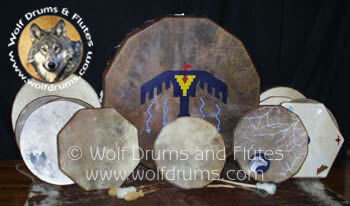 Wolf Drums and Flutes is primarily an online retail business. We do not have a physical shop front. 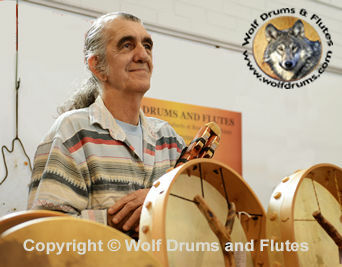 Wolf Drums and Flutes is a family run business based in Sydney, Australia. We hand make a range of quality craft items with Native American, Siberian and Saami style influence.We also provide a range of herbs, incense and related products to both retailers and resellers. Throughout the year we run drum making workshops providing our participants with the opportunity to make their own quality rawhide drum. Our handcrafted products include drums, flute, bags, feather smudge fans, rawhide medicine rattles, dream catchers, medicine pouches, bone hairpipe jewellery and more. Each year we exhibit at a variety of Psychic and Alternative Expos throughout Australia which provide people the opportunity to view and buy our products direct. The expos are a great opportunity to meet and greet. Our goal has been to offer the best quality Native American style drums and flutes, Saami & Siberian style drums, and other handmade arts and craft (made in Australia by us) at reasonable prices. After making his first drum Graeme spent about a year assisting his teacher in drum making workshops to learn more about drum making. During this time he also made many drums as gifts and for himself to work on his technique. He then spent time with a professional taxidermer tanner to learn about the different hides and various tanning techniques. Wanting to take his craft further Graeme then went to a master wood bender to learn how to bend drum hoops. Over time he's developed his own way of curing raw hide and making drum hoops. Graeme is also a qualified addictions counsellor with further qualifications in co-dependency, self-esteem and anger management. He's also a survivor of childhood abuse and the drum helped reduce his therapy time from the quoted 5 to 10 years down to 18 months. Graeme continuously looks for ways to improve his craft work and the quality of the drums and flutes he makes. Graeme is a true artisan and master of his craft.